Sweet apples and creamy ricotta cheese come together in this Mexican-style crepe that’s irresistible when it comes straight out of the oven. The perfect balance of savoury and sweet makes this a flawless ending to an evening meal. Preheat the oven to 350°F (177°C). Set aside a 9 x 9 inch baking dish. Make the apple filling by melting the butter or margarine in a large non-stick pan over medium heat. Add the sliced apples and 1 tablespoon (15 ml) of the sugar. Cook 5 to 8 minutes, stirring occasionally, until apples begin to soften. Stir in the remaining tablespoon (15 ml) of sugar and the cinnamon and cook 2 minutes more. Remove from heat and set aside. Meanwhile, make the cheese filling by whisking together all the ingredients in a small bowl. Warm the Udi’s Small Tortillas in the microwave or on the stove top according to package directions and place on a flat work surface. Spread ¼ of the cheese filling in the centre of each tortilla. 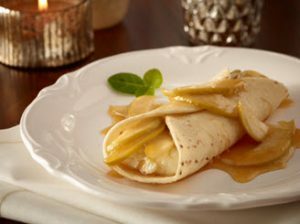 Top with ¼ of the apple mixture (reserve pan for sauce) and fold by tucking in the two long sides of the tortilla. Place seam side down in the baking dish. Place the pan back on the stove and make the sauce by adding ½ cup (125 ml) water. Bring to a simmer and stir in the sugar and butter. Cook 3 to 4 minutes until sauce starts to thicken. Pour over the crepe and bake for 15 to 20 minutes until crepe are heated through and sauce is bubbly. Serve immediately.